premium light tank, the first high tier light tank to join blitz. For links to my other guides made, please visit my profile - the links are provided in the "About Me" Section under the spoilers. still carry it in service. AP, I earn around 30-50k on decent games. the disadvantages of small maps, etc. should it be a necessity, 1,150 can help cover several hits. quarters combat. The accuracy and aim time is more than enough for blitz maps. Good view range: although less important in blitz than console or PC, it is still a key feature. This tank can spot if it so wishes, and I have seen games with 1-2k assist damage. penalty for movement, only firing. necessary targets. It is certainly an outlier of the Chinese tech tree when it comes to depression. to get up to speed varying on the terrain. 100m, expect many misses. The tank can have large bloom circles when moving fast. often, so carry repair Kits. Crew members also die often, so be careful. enemies without support. Also, don't engage 1v1 with mediums, as you will be at a disadvantage. (mines..cough..cough), spot, or just provide supportive fire. As a light tank you need to ADAPT. Recommended equipment: Feel free to change, this is my loadout which I've found to work well. Recommended provisions: Feel free to change, this is my loadout which I've found to work well. Recommended Consumables: Feel free to change, this is my loadout which I've found to work well. 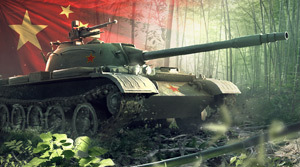 can be extremely fun, especially in a toon with another Type 62, or a faster medium. ADDITIONAL INFORMATION: You can also check out the podcast done by Lokeen and Lephturn, where I did an episode on the Type 62. You can find the podcast HERE. It is podcast No. 48 "Enter the Dragon." down below if you felt that this guide helped you. Edited by Unitater, 06 June 2016 - 05:08 PM. I rate this guide 11 Poutines out of 10! Thanks Tater! I actually don't think you missed anything! This is a +1 well deserved! Aw thanks! Happy to be of service! Good to see your writing again Rocky Mountain Man! haha good to see you too señor perro! Another great guide! I missed the type 59 sale, so I bought the 62 thinking that I could essentially run it as a baby 59 with it's dpm. Nope. It wasn't until the tank boom podcast you were featured in that I finally broke myself of my suicidal habit of brawling with it. On another note, I occasionally bounce shots with it that i really have no business bouncing, like when a td fires at my hindquarters while I'm zipping to cover. Sometimes, rng smiles upon the foolhardy. This guide wasn't useful to me, since I don't have the Type 62 and I already knew its weaknesses, but it was still very entertaining to read! Next time, though, you should include specific and exact stats of the tank. pretty sure he's got everything there, right down to chances of engine fire. Thanks, very useful including telling my common mistakes using type 62 night mare to meet multiple meds alone or be ambushed by Rhm. Otherwise a legendary tank to drive with full of dramas and fun. when will this tank go into store again? Game Discussion → General Discussion → Buy it! BUY IT NOW!